From the town of El Calafate, visit the world-famous Perito Moreno Glacier to witness the spectacle of icebergs calving from the face of the glacier and crashing into the icy waters below. Combine this with a boat ride on Lago Argentino to absorb the wide expanses of Argentina’s largest lake, and visit the massive Upsala Glacier. This short independent experience takes in a remote and incredibly beautiful part of the world, where the forces of nature are at their best. On arrival at El Calafate Airport, you will be met and transferred to your hotel in town - a distance of 20 kilometres. 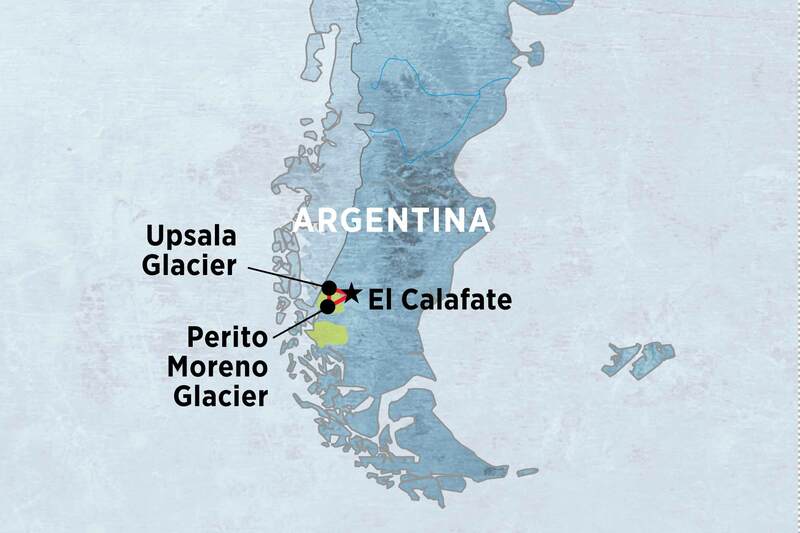 El Calafate is a small remote community that is named after a small dark berry that grows in abundance around the area. It was officially founded in 1927 and has a population of 6000. In the evening you will be free to wander around and absorb the lively atmosphere in the main street (Avenida del Libertador General San Martin), accentuated by the long twilight of the southern summer. This evening you will have a briefing with your tour guide outlining the plans for the next few days. After breakfast you will set out on a day trip to Perito Moreno Glacier. You will travel 160 kilometres to get there and back, mainly on paved roads and over an area of wide barren plains known as Peninsula Magallanes. If you look up, you may be lucky enough to see condors soaring overhead. Upon arrival, you will view arguably the world's most famous glacier from various vantage points. The spectacle you encounter here is not only one of sight, but also of sound. Thunderous cracks are followed by equally tremendous splashes, as great chunks of icebergs from the glacier wall break off intermittently and crash into the waters of the channel. Please pay attention to the signs around the site warning about the dangers of 'flying' ice. You will have three to four hours to explore this fabulous region. Those interested can book on an optional mini-trekking excursion where, after being provided with crampons and pick-axes, we get to actually walk on the glacier itself. The additional cost for this optional excursion is approximately US$145. Your local representative can help to arrange this activity for you, but this will need to be arranged on arrival. (Please note that if you opt to join this excursion, lunch can be purchased at the site; alternatively, you may like to bring along your own picnic lunches). IMPORTANT NOTE: PERITO MORENO GLACIER - MIN TREK Please note the maximum age limit for this activity is 65. The operator that runs this will not make any exceptions, even with a doctors certificate. Those 65 and older will instead be able to walk along the platforms and balconies surrounding the glacier & take in this magnificent site from a number of angles. Weather depending, your guide may also be able to organise some free time at the north face beach (viewpoint) of the site. Early in the morning you will drive 45 kilometres to Puerto Bandera, on the northern branch of Lake Argentino, where the boat "Upsala Explorer" will be waiting for you. The average depth of the lake is 150 metres, although the deepest point is up to 500 metres. The boat will navigate to Upsala Glacier, cruising past several impressive ice bergs. Photographers in particular will delight in taking photos of these amazing white formations set against the backdrop of the mountains and the sky. You will also cruise along the 10-kilometre face of the glacier, which extends back 50 kilometres, making it the largest in the area. However, unlike Perito Moreno, this glacier is retreating. Upon arrival at Estancia Cristina, you are invited to visit the museum that focuses on the foundation and development of the ranch. Next comes a guided walk to the Caterina River and the chapel, and a tour of the historic centre of the estancia. After this, visitors are taken on a short/easy trek, lasting about two and a half hours, to Cascada de los Perros, a surprisingly beautiful waterfall surrounded by copses of Antarctic beech, and from where you can enjoy a bird's eye view of the Caterina River valley and the estancia. Lunch will be included at the estancia, and afterwards there will be time for an optional walk with one of the local guides. On your return boat journey, you will be served afternoon tea, and continue to your hotel in El Calafate, arriving around 8 pm in the evening. The services of an expert English-speaking local guide. Full-day excursion to Perito Moreno Glacier. Boat excursion to Upsala Glacier. 2-day entry fee to Los Glaciares National Park. Accommodation: 3 nights comfortable hotel. Meals: 3 breakfasts, 1 lunch.